LPC2E has been developing stratospheric balloon instruments for more than 30 years. In particular, the SPIRALE instrument has been a great success, resulting in more than 40 A-level publications and participating in several of international campaigns. Unfortunately, this instrument can no longer fly. 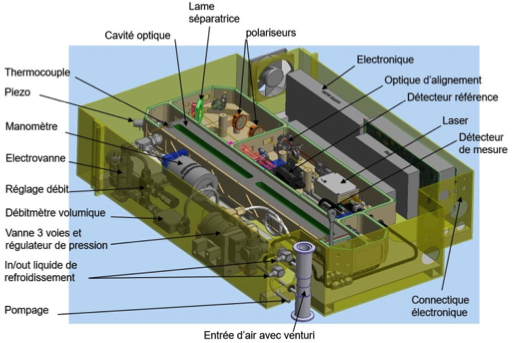 In order to replace it while improving its performances and ease of implementation, the LPC2E has engaged in the development of a new instrument, SPECIES (SPECtromètre Infrarouge à lasErs in Situ), which will be usable both under balloon, in aircraft and on the ground in order to optimize its use. The initial objective was to develop a balloon version of the SPIRIT instruments. However, new optical techniques for intra-cavity detection have much better detection limits, in particular the OF-CEAS (optical-feedback cavity-enhanced absorption spectroscopy) technique invented by LIPHY (UMR CNRS – Université Grenoble). LPC2E has therefore undertaken to master this technique and to develop a series of instruments based on it in collaboration with LIPHY. A QCL laser emits its beam into a resonant cavity formed by three mirrors of very high reflectivity. This cavity constitutes a Fabry-Pérot interferometer of very great finesse whose spectrum of transparency is a comb with extremely narrow teeth. Some of the light coming out of this cavity returns to the laser. This cavity can therefore be considered as an external cavity of the laser which then emits a beam at the wavelength of the transmission peaks of this cavity. The system then becomes transparent and the injection of laser power into the cavity is very efficient. Since the lifetime of photons trapped in the cavity is very long, the length of interaction of photons with the gas present between the mirrors can reach tens of km (compared to < 0.5 km for SPIRALE), thus allowing very low detection limits to be obtained. The measuring principle consists in a current scanning of the QCL which “clings” on successive peaks of the cavity (see the signal graph on the central scheme). The presence of a molecular line of an absorbent gas will then result in a decrease in the signal. Quantitative measurement of the concentration of this gas requires knowledge of the lifetime of photons. This is achieved by turning off the laser at the end of the scan, the ring-down measurement (see the right figure). The general architecture of SPECIES is based on the design of several interchangeable modules compatible with the 19-inch optical rack format that can easily be integrated into the standard racks used in research aircraft. Each of the racks constitutes a complete OFCEAS system. General and dedicated systems for balloon or aircraft experiments such as energy supply and distribution, pumping, TM-TC or HMI systems are specific systems also grouped in the same global rack. The entire SPECIES rack with three instrument racks weighs about 100kg for a peak power consumption of 800W. The expected instrumental characteristics are presented in the tables below. 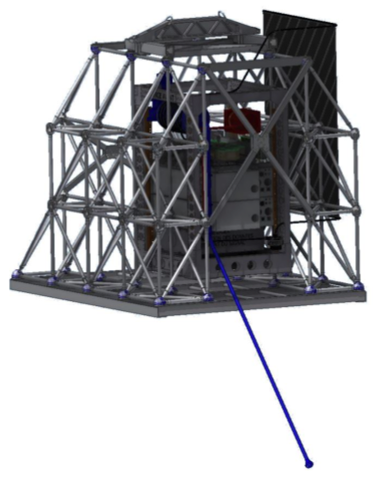 The construction of the first three optical racks is achieved and the global rack dedicated to balloon flights has been tested in a representative climatic chamber at CNES (Toulouse) in February 2018. The first flight was performed in August 2018 in Timmins (Canada) as part of the Strato Science campaign organized by CNES and the Canadian Space Agency (CSA) (https://twitter.com/CNES/status/1030383283694186496). SPECIES is a highly evolving instrument due to its modular design. As soon as possible, adaptation to aircraft will be engaged to increase measurement opportunities. Moreover, in relation to each scientific objective, the optical racks can be adapted by changing lasers or by building a new rack dedicated to one or more chemical species to be measured. Thus, in the long term, a balloon experiment could include 6 optical racks in 2 global racks allowing the simultaneous measurement of more than a dozen chemical compounds, thus exceeding the performance of the SPIRALE experiment.